Shinty is an important part of our lives; it was the sport that brought our musical careers together as we formed the Scottish folk music duo Caman. Stuart is goalkeeper for Glenurquhart and since moving to the Highlands over 12 years ago, I've followed and supported Newtonmore. At the weekend we travelled in different directions as Stuart headed for Drumnadrochit to take on Inverness in a MacTavish Cup quarter-final and I headed to Newtonmore to watch them play Lochaber in another of the Cup's quarters. The MacTavish Cup is contested every year by teams from the North of Scotland, first played for in 1898 when Skye Camanachd were victorious. Newtonmore have won the rose bowl trophy a record 38 times, including 11 consecutive victories between 1970 and 1980. Legend has it that during a period of Newtonmore dominance, one winning team played football with the rose bowl upon returning to their Highland village, which resulted in the trophy undergoing an extensive repair and redesign. The trophy is looked after much better these days! In any case, Stuart and I were pleased that Glenurquhart and Newtonmore booked their semi-final berths with 3-0 victories against Inverness and Lochaber respectively. The other quarter-final ties comprising Skye, Fort William, Kilmallie and Kinlochshiel will take place in the coming weeks. We both have contrasting memories of the MacTavish Cup involving our teams. 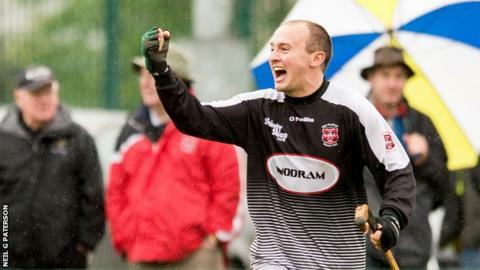 Stuart has kept goal for the Glen in three finals but has unfortunately been on the losing side every time. In 2008, his team were defeated 6-1 by a rampant Kingussie side. In 2013, Stuart reached his second final, which was a much closer affair, and resulted in the first MacTavish final to be decided by a penalty shoot-out after Glenurqhart and Lovat had drawn 1-1 after extra time. Luck once more deserted him as Lovat won that 3-1. The following year the same sides again contested the final and again Lovat were victorious, this time winning 5-1, leaving Stuart with three runners-up medals. He feels his best opportunity for success, in the 2013 final, was scuppered when Andrew 'Scuffer' Corrigan wasn't allowed to take his forwards stick. Rumour has it that Scuffer's father keeps it safely locked away in a cupboard for the son he wished he'd had, Donald Fraser. My lasting MacTavish Cup memory takes us back to 2009 and to one of the all-time classic finals in which Newtonmore defeated their great Badenoch rivals Kingussie 5-4. This was Newtonmore's first major trophy since they won the same competition in 2002 when a young Fraser MacKintosh atoned for two horrendous Colin Stewart errors to score late on and lead Newtonmore to a 3-2 victory against Kilmallie. The 2009 final saw Newtonmore take on a Kingussie team in their prime - they had won 17 of the previous 21 finals. Two goals from a young Evan Menzies, plus solitary strikes by David Cheyne, Paul MacArthur and Glen MacKintosh saw the trophy heading back down the A9 with the Eilan team. The victory kicked off a memorable week-long celebration as the squad waited for the return of Norman Campbell from his honeymoon. Upon his return, the Balavil Shinty Bar rang to the chorus of Newtonmore songs such as 'Jock Paul's Bike', 'Rise and Follow Charlie' and in honour of their victorious manager 'Wee Norrie MacArthur'. Back to the present day and this year's MacTavish Cup still has plenty in store for Glenurquhart and Newtonmore. Tough semi-finals lie ahead before either side can contemplate facing each other in the final in June. Should that be the outcome, Caman gigs and rehearsals are sure to be interesting in the lead-up. This coming weekend most teams are back in league action and, as always, they pose plenty of questions. Who will win the Marine Harvest Premiership top-of-the-table clash between Lovat and Kyles? Who will progress to the Camanachd Cup first round proper in the replay between Beauly and Kilmallie? Will there be any significant movers and shakers in the lower divisions? And finally, will Newtonmore's Norman Campbell have his new set of false teeth on show as his side take on Inveraray? So whether like Stuart you are lucky to play the game, or like me enjoy it from the sidelines, get yourselves down to your nearest game this weekend, support your team and enjoy what the fantastic sport of shinty has to offer. Long shall the caman's clash and the battles continue."